TOKYO, 2009 (Reuters) – Japan agreed to partner with Moscow in developing new gas projects on Russia’s Pacific coast that will extend the Kremlin’s reach from its European stronghold into fast-growing Asian energy markets. Gazprom, Russia’s state-owned gas export monopoly, signed a memorandum of understanding with an arm of the Japanese Ministry of Economy, Trade and Industry to examine ways to process gas in Russia and export it to Asia, including Japan. “This could take our co-operation with countries in the region to the next level, provide them with additional energy volumes and strengthen Gazprom’s position in these new, competitive markets,” Chief Executive Alexei Miller said. Japan, the world’s fourth-largest energy consumer, is heavily reliant on imports to fuel its economy and population. Gas accounts for 14 percent of the country’s energy consumption, Gazprom said in a statement, adding this proportion was rising. The first cargo of liquefied natural gas (LNG) from the Gazprom-led Sakhalin-2 project arrived in Japan this year (2009). The next wave of projects could include a gas processing plant near Vladivostok, Miller said. “Russia’s role in Europe is one-quarter,” Miller told reporters, referring to Russia’s share of Europe’s gas market. Itochu Corp and Japan Petroleum Exploration Co (Japex) also signed up to the memorandum, as well as the Agency of Natural Resources and Energy, part of the Japanese Ministry of Economy, Trade and Industry. The memorandum formed part of a parcel of agreements signed during Russian Prime Minister Vladimir Putin’s visit to Japan. Gas would be delivered to Vladivostok along the new Sakhalin-Khabarovsk-Vladivostok pipeline, which Gazprom’s Miller said would be completed by the end of 2011. Gazprom did not give more details of its plans to process gas. Primorye governor Sergei Darkin said in February that his region, which includes Vladivostok, could play host to Russia’s second LNG plant. 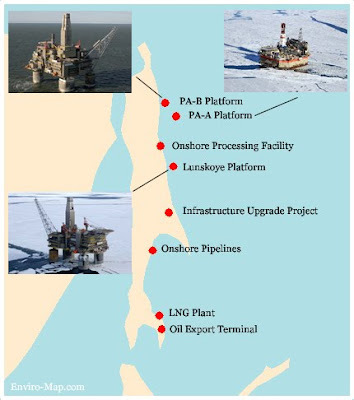 Miller also said Gazprom had begun development of the Sakhalin-3 gas project. Though it was too early to determine partners for this project, he said those companies with which Gazprom had worked on Sakhalin-2 would take preference. 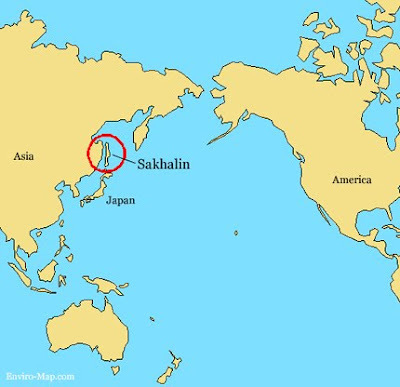 Royal Dutch Shell and Japanese firms Mitsui and Mitsubishi Corp are Gazprom’s partners in the Sakhalin-2 project.